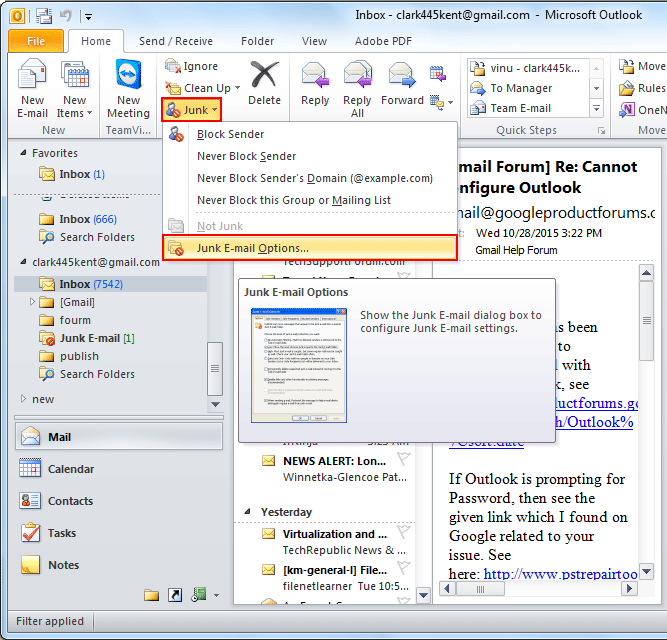 MS Outlook application Junk Email Filter feature helps to reduce undesirable email messages available in Inbox folder. This filter significantly moves the Junk or spam emails to Junk Email folder. This blog will provide synopsis about Outlook Junk Filter and will discuss about working of this filter. Junk Email Filter examines the entire incoming email messages in order to examine whether the email is spam based on several parameters. These parameters include content of the email message, time of sending email message, etc. This Junk Email Filter is available by default but the protection level is set to low. The low protection level restricts the emails, which has high probability of being spam; otherwise, it will let the emails pass in the Inbox folder. However, if you want to manage the filter and change level of protection, you can change the settings. The filter option will not completely cease the transfer of emails but only move the intended emails to Junk E-mail folder. 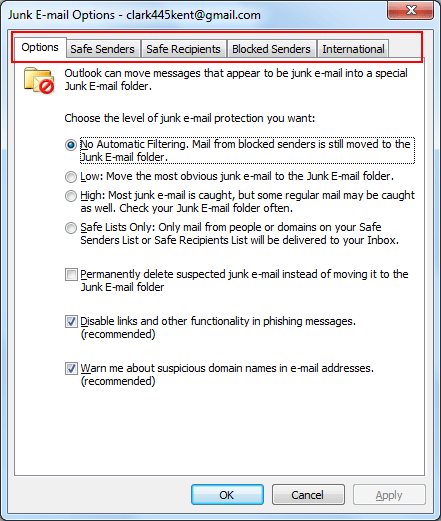 Junk Email Filter settings can be done in Junk E-mail Options dialog box. 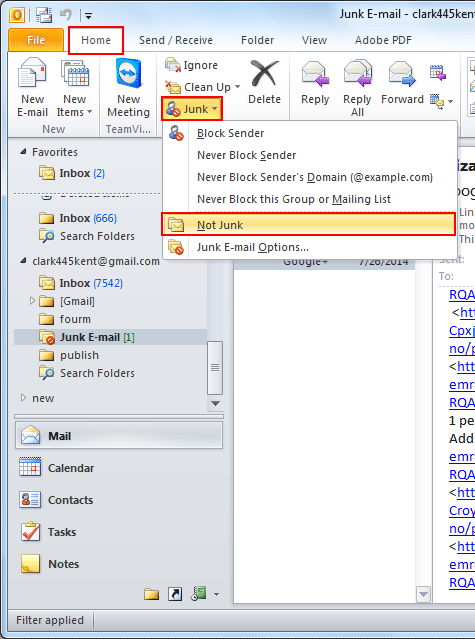 For this, go to Home tab>> Delete group>>Junk>>Junk Email Options. How To De-Spam Any Message From Junk Folder? Junk Email filter by default checks minimal parameters for flagging any message to be spam. However, users can perform additional settings for incoming messages to consider it as spam. These settings can be done by users through Junk Mail Options by adding names, email addresses and domains to this list to block the emails from respective sources. There are various tabs (Options, Safe Senders List, Safe recipients List, Blocked Senders List, and International) in Junk Email Folders through which users can perform advance-filtering settings. Safe Sender List: Emails from email addresses and domain names for ids available in the Safe senders list will not be counted as junk emails despite of the content present in emails. Users can manually add contacts to this list. In case users are using Exchange server account, these addresses in GAL will be considered safe. Safe Recipients List: If user's ID belongs to a mailing or distribution list, user can add this list sender to Safe Recipients list. Messages, which are, send to these particular email ids or domains will not be considered as Junk despite of the content present in the message. Blocked Senders List: Emails from any particular sender can be added in this list in order to block them. When users add names or ids to this list, MS Outlook application blocks messages coming from listed sources to Junk Email Folder. Emails coming from these sources will be always considered as Junk by Outlook. Blocked Top-Level Domains List: This comes under International tab, which lists the country/region codes in order to block any messages from it. For example users can check the country names according to codes provided like; GB for United Kingdom and CN for China. This will block messages belonging to email addresses ending in .gb or. cn. Blocked Encoding List: It is another advance option coming under International that blocks the messages appearing with another alphabet or character set. Cached Mode Enabled Exchange Accounts. Exchange Account Delivering Emails to Outlook data file PST. MS Outlook Connector for IBM Domino. Junk Email Filter helps you stay away from the unwanted emails entering INBOX folder. It can be implemented to avoid email transfer to Inbox folder for better management. In case users want to change profile, they can export the items of Junk Email Lists and import it in new Outlook profile. In this way, users will not need to create the Jun Email Filter Lists again.